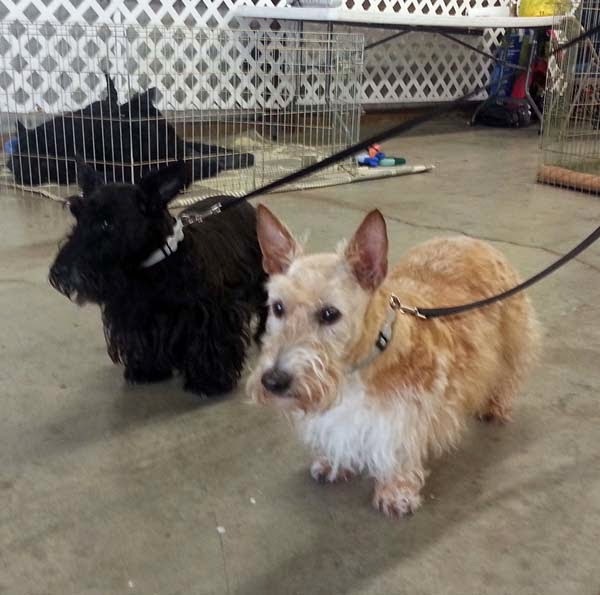 Yesterday, we made the long trek to Lebanon, Tennessee to attend the Tennessee Scottish Terrier Rescue's annual picnic. Much to Heather's dismay, it was raining but that didn't stop us. Heather and Mr. K arrived in style with their baby blue and yellow raincoats, and they were greeted by more Scotties than I've ever seen in one place at one time. There was so much barking as we walked around. It obviously was a little disconcerting for Heather and Mr. K who are used to a very quiet lifestyle but they managed just fine. The noise was very much music to my ears - so many happy Scotties in one place! - but had Scottie Dad reaching for the Advil within minutes. I stopped when I saw Bella's puppies. Bella is a purebred Scottie the Tennessee rescue group saved last fall. Just a day or two after she was placed safely in the hands of Tennessee Scottish Terrier Rescue, she delivered four puppies...two of which were still looking for loving homes of their own at the time of the picnic. Bella and the two other puppies had already found furever Scottie Moms! What do you mean you want to take them with us?! 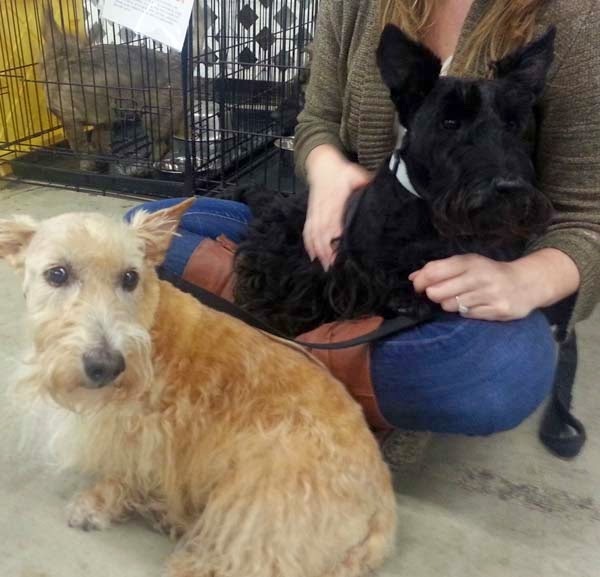 I stopped when I saw these two because I knew where there was a Scottie and/or Scottie mix in need, Heather's foster family wouldn't be far away. That, and I was amazed by how big the pups had gotten since I had last seen photos of them! Heather's foster family had taken in Bella and her puppies the day after they were born. The two that remained, Cocoa and Snickers, were now just as tall as Heather and Mr. K. They are some sort of shepherd mix and they are very beautiful. So beautiful, in fact, they caught Scottie Dad's eye and for a brief moment, I thought I might finally have the keys to bring those two more rescues I've wanted through our doors! It wasn't more than a few minutes later that Heather was greeted by her Foster Scottie Dad. It took two years but we finally made a reunion happen! Heather was happy to make herself available for extra back scratchings and soaked up every bit of attention she could get. We settled in and I took Cocoa and Snickers from their crates, hoping to win Scottie Dad over. Snickers came out first and as I held him in my arms, I laughed at seeing just how quickly two pairs of Scottie eyes shot up at me cradling a pup that wasn't them. Mr. K was especially not amused. Keep us close, Scottie Mom! Alas, Scottie Dad didn't cave (yet) but did suggest we could trade Heather and Mr. K and then we could take the two Scottie/Shepherd mixes. (GASP!) If you think Heather and Mr. K's eyes shot up at me fast then you should have seen my reaction to Scottie Dad's moment of insanity. (And let's also point out that he is still in the dog house for that comment!) Cocoa and Snickers eventually found a furever home together in Columbia, South Carolina - where I found Mr. K years ago. However, there are still others needing homes. I have all the confidence in the world in the Scottish Terrier Rescue of Tennessee and their ability to find these precious pups find the homes they deserve. Loved all the photo's I would take them all if I could!!!!! 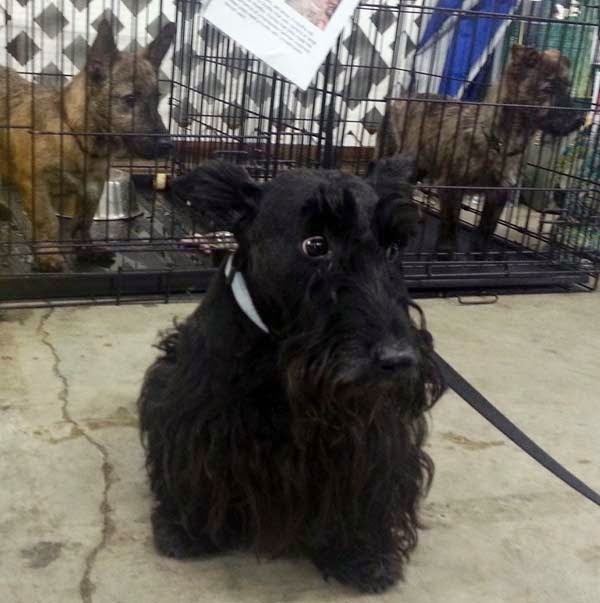 When I saw all those Scottie's that needed a home my heart was so sad. I know that's how I got the sweet boy that rescued me. I just don't understand how you let your pet go. We will be keeping our paws crossed that Cocoa & Snickers get to join your family...or some other loving family. What a fun picnic. You look like you are having a great time. Looks like everybody had a great time!!! Loved the pictures and hearing the update. Great update, ScottieMom! You are right, Cocoa and Snickers are indeed, beautiful pups! We are hoping to meet a rescue to bring home from the TN group! Paws crossed!